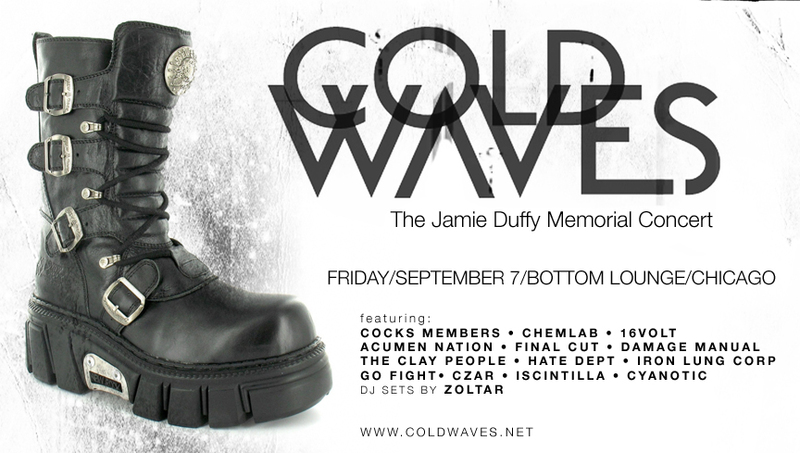 In addition to being a sound engineer and producer, Jamie was also well known across Industrial Music’s landscape for his contributions as a member of the Coldwave/Metal hybrid band, Acumen Nation and the Drum and Bass project, Dj? Acucrack. Friday September 7th’s concert starts at 7pm (tickets $20-$50), finishing around 1am with all proceeds going to assist Jamie Duffy’s family with funeral costs. Paying tribute to this great man will be several of Jamie Duffy’s peers and friends with whom he produced, remixed, engineered or just plain influenced. An all star cast including such well known names of the industrial genre includes Paul Barker, Chris Connelly, Jared Louche, Martins Atkins, Steven Seibold, Jim Marcus, Jason Novak, Eric Powell will be performing selections of songs by their bands; Revco, Chemlab, 16volt, Acumen Nation, Damage Manual, Hate Dept., Claypeople, Go Fight/Die Warzau and more , while finishing with an all star jam worthy to pay their respect to this great man.